Antiques Market. Are you ready for the biggest sale in the city? People clean out their attics, garages and basements to create the most spectacular garage sale around! Vast range of antiques and collectables. Including jewelry, ceramics, books, furniture, pictures, paintings, metal work, rustic memorabilia, toys, trains and tools. If you prefer to hunt for handicrafts, today`s game will be a perfect fit for you. Kevin, Brian and Amanda have a passion for antiques. Buying an antique to take home is the thing they love the most and this common interest is what brought them together in a first place. They are regular visitors to garage sales in search of old valuable items. For the past two years we’ve been pouring our hearts and souls into the flea and antiques markets that can unearth all sorts of rarities. 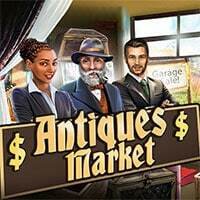 Antiques Market is a free online hidden object game on Hidden4Fun.